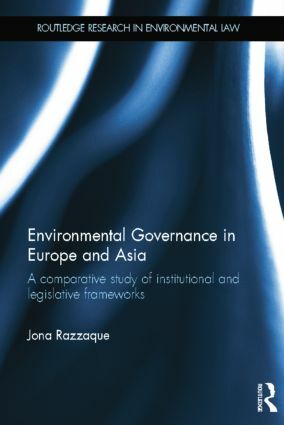 This book looks at environmental governance in both Asia and Europe and offers a comparative analysis of the two regions in order to provide a better understanding of the concept of ‘environmental governance’ and its status in Europe and Asia. The book assesses the legislative, institutional and participatory mechanisms which affect the overall development of environmental governance, and analyses current issues, concerns and strategies in respect of environmental governance at the local, national, and international levels. The rapid changes in economic, social and political life have had an enormous impact on Asia’s ecosystems and resources. Asian countries, in the name of economic development, are following the same environmentally destructive path their European counterparts followed in the past. The key to the environmental future of these two regions lies in the evolution of the character of governance - the ensemble of social ethics, public policies and institutions which structure how state actors and the civil society interact with the environment. This book will be valuable to scholars and students of environmental politics, EU and Asian studies, public policy, environmental law, and to decision makers and policy analysts. Jona Razzaque is a barrister and an Associate Professor in Environmental Law at the University of the West of England (UK). She has published widely on access to justice and participatory rights in environmental matters.